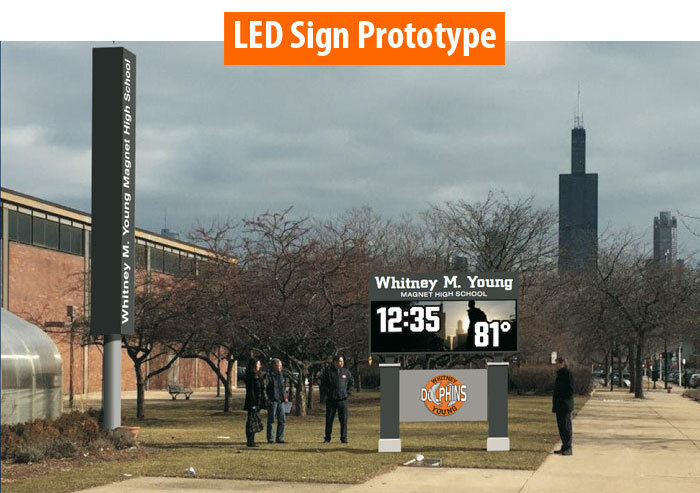 Whitney Young is in need of an electronic sign. You can make that happen by making a financial donation to this important cause. The sign will be on Jackson Boulevard between the Academic Building and the Gym. Anyone who drives or walks by will see your name in lights if you donate $1000 or more to Giving Tuesday. Scroll down to see the mock up. The sign will also inform everyone of upcoming events from basketball games to school plays to class reunions! It will let everyone know about the many championships, the students with perfect ACT scores, Debate Team winners, and Merit Scholars. The cost of the sign is $36,000 and thanks to Whitney Young Alum we have already raised $12,000. Please do what you can to help!